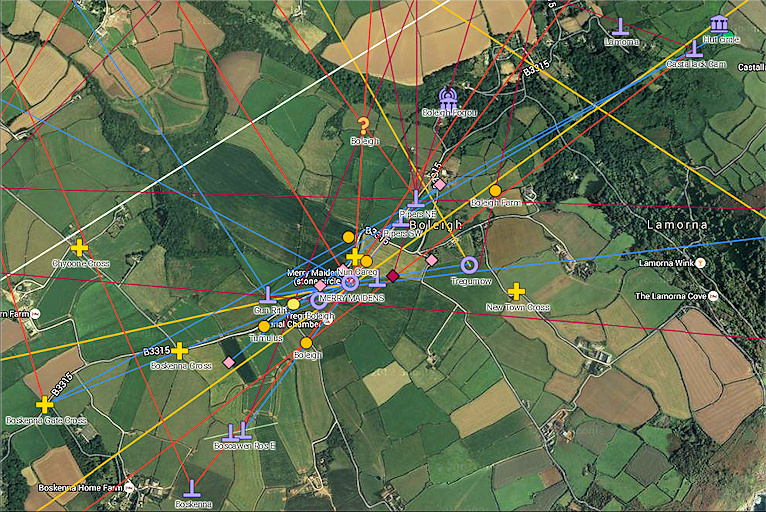 Stone circle complexes are as important as stone circles themselves, orbiting around the gravity-centre of the stone circles. They are quite different from each other in shape and character. Complexes are made up of arrays of menhirs, cairns and other features that orbit stone circles, within a mile or two, or in view. The Merry Maidens complex is very definite, quite localised, following a WSW-ENE axis, and it has a wide range of features - menhirs, cairns, crosses. The Tregeseal complex is also quite definite, following an axis with a similar orientation, but nowadays it is in a poor state - mainly eroded cairns. It's dominated by a granite tor, Carn Kenidjack. The Nine Maidens (Boskednan) complex is not pronounced when you visit it, much of it now-eroded and overgrown cairns, but this circle, with its former sister circle the Mên an Tol, plays a part in an array of sites that seems to be designed with terrestrial more than astronomical interests in mind. It's dominated by a tor, a hill and a wide-open panorama. Around Boscawen-ûn a constellation of menhirs could be seen from the circle, some of them astronomically aligned, and more evenly spread around the stone circle, and there is a hill, Chapel Carn Brea, in the middle background. Of the four, only Boscawen-ûn was a single circle. The others had two stone circles, with the uncertian possibility of a third at Tregeseal and the Merry Maidens. More about all this below. This once comprised two or three stone circles and a number of menhirs, including Cornwall's largest (The Pipers), and a number of cairns. It is arrayed mainly along a WSW-ENE axis that is highlighted by the main yellow alignment passing through it (see map right). 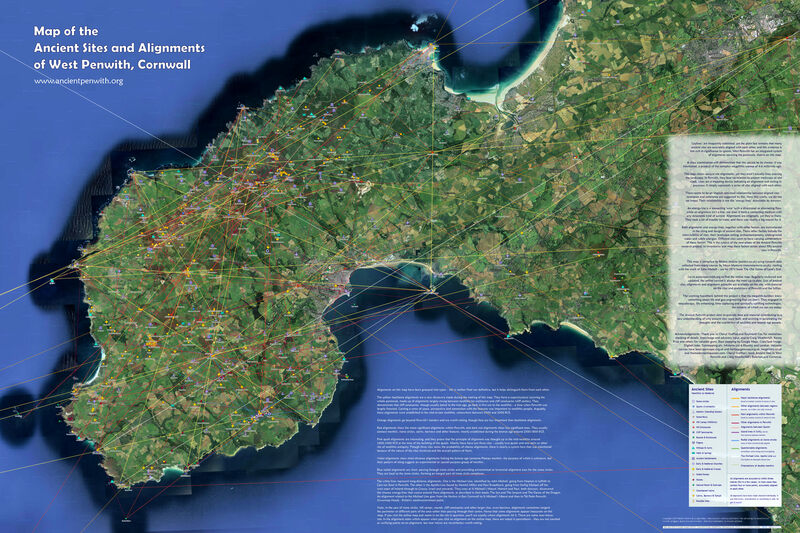 This alignment leads from Carn Brea, through St Michael's Mount to Treryn Dinas - a major backbone alignment. This has an azimuth of 54.3° - the rising point of the sun around early June and mid-July (if indeed it is astronomically oriented - it might be more terrestrially significant). A sub-axis in the complex follows a short internal alignment from Gûn Rith, through the centre of the Merry Maidens, through a now-fallen menhir and a hedge menhir to the now-disappeared Tregurnow stone circle, with an azimuth of 81.1°. It's blue on the map above. In the northeast of the complex, the adjacent Pipers menhirs act as a pair. 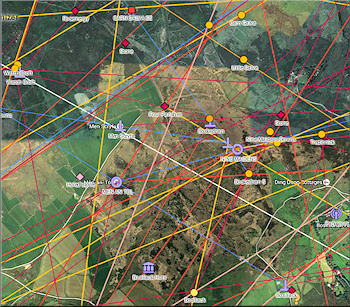 The southwestern Piper seems to handle alignments within the complex (in blue on the map), while the northeast Piper takes alignments from further away. 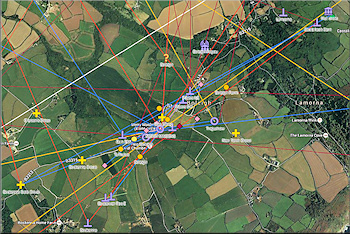 One example is an alignment of Tregurnow stone circle, through the northeast Piper to Boscawen-un stone circle and ending up at Bartinney Castle. 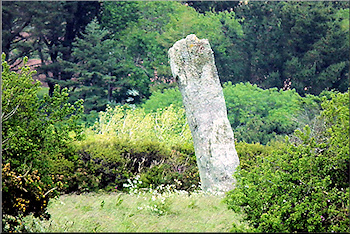 The Pipers are counterweighted on the other side of the Merry Maidens by the twin Boscawen Ros menhirs. 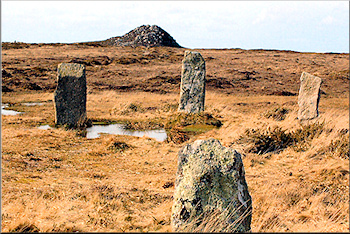 The western menhir is aligned with the centre of the Merry Maidens and then the Pipers. Meanwhile, the eastern menhir aligns with the southeastern edge of the stone circle and the Pipers. The headscratcher is, why? What's the purpose of this? A comprehensive multi-discliplinary survey of the Merry Maidens complex is needed. It is very much affected by the road and hedgerows in the vicinity when, clearly, in the complex's heyday, it might have been some sort of landscaped parkland with visual characteristics we cannot imagine, and a clearer horizon than today, without hedgerows and today's strange proliferation of overhead wires and telegraph poles. 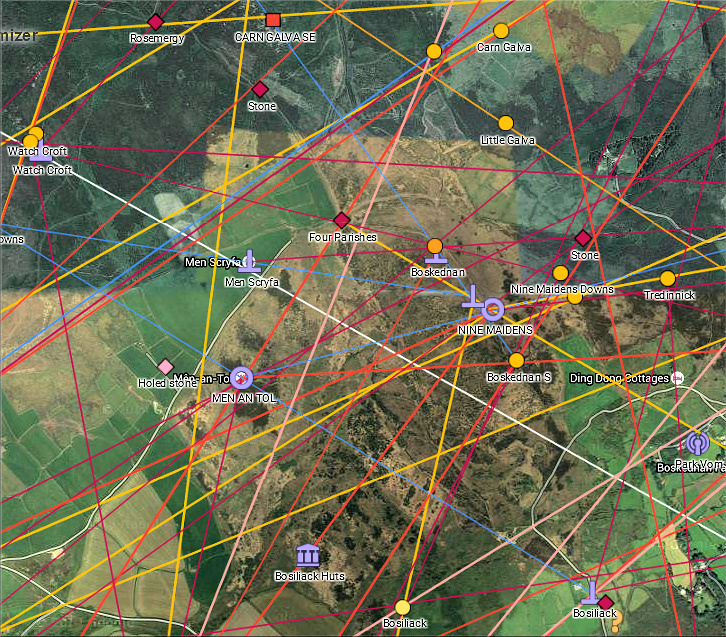 Notable are a number of holed stones (pink on the map above). The best estimate is that these were very accurately aligned to obtain exact readings for certain astronomical phenomena. The holes are not large. The chances are that this concerned observation of a rising star or planet rather than the sun or moon: a narrow series of aligned holes would counteract extinction, when stars disappear while close to the horizon because their light is insufficient to get through the earth's atmosphere when low on the horizon. However, a line of tightly-aligned holed stones could exploit the virtues of the slight atmospheric magnification that stellar objects have when they are close to the horizon. This might have been an early bronze age scientific precision instrument. Alignment 123 from the Merry Maidens goes to Carn Lês Boel, then to Knackyboy cairn on the Scilly island of St Martin's, then to a kerbed cairn on Gweal Hill, Bryher. Another interesting alignment went from Tregurnow stone circle to Sancreed Beacon, through the Botrea Barrows to Pendeen Watch, a significant cliff sanctuary on the north coast of Penwith. This complex is more spread out and radial than the Merry Maidens complex, with a gaggle of menhirs a few fields, 600-800m away, from the stone circle, with more further still. 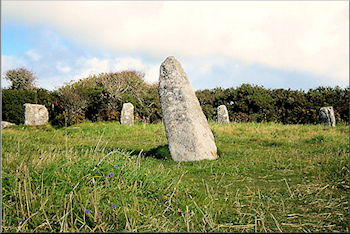 Boscawen-ûn is more of a hub than any other stone circle in Penwith: it stands at the very centre of the southern half of the peninsula, with radial alignments reaching out to several of the major cliff sanctuaries - Carn Lês Boel, Treryn Dinas, Cape Cornwall, Gurnard's Head, Maen Castle and St Michael's Mount. Their relative angles need analysis. It's one of those stone circles where you can spend time alone, because it is a little tricky to find so tourists and walkers tend not to go there. But it has frequently displayed a classic and uncanny symptom of an 'alive' stone circle: when you arrive, someone else might just be leaving, and when you leave, someone else comes along to take over. Stone circles can have a presence and a will of their own. Boscawen-ûn is fondly regarded by many. It was saved from destruction in the 1860s by a lady in Penzance, Miss Elizabeth Carne, who, hearing the farmer was about to destroy it, bought the property and had the circle's enclosing wall built to protect it - one of the first instances of antiquity preservation in British history. God bless Miss Carne. Many argue that the stone near the centre of the circle leans accidentally owing to damage, but this is unlikely. Although such a stone is quite unusual amongst stone circles in Britain, it looks intentionally inclined, and dowsers report the power centre of the circle to lie directly under the top tip of the stone, not at its base. It feels as if this stone has national significance. It points up the peninsula of the southwest of Britain at an azimuth of 53° in the local-horizon direction of the summer solstice sunrise. It's as if it stakes down the national energy-field of Britain at one of its corners (perhaps with the Ring of Brogar in the Orkney Islands at the other end). Boscawen-ûn was known in the Welsh Triads as one of the three chief Druid gorsedds or eisteddfod sites of southern Britain (the other two conceivably being at Caerleon and Old Sarum). 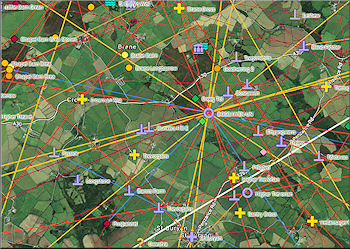 Much more study is needed of the various orientations of Boscawen-ûn's surrounding menhirs, and of their original intervisibility in the days before today's agricultural landscape was installed, since they clearly constitute one unified system. Notable also is the orientation of Chapel Carn Brea, visible WNW from the circle, together with a gap or entrance in the circle of stones that opens to the hill. The rock outcrop 150m to Boscawen-ûn's northwest, Creeg Tol, is quite energetic, providing a panorama of the circle - it lies on the above-mentioned alignment from Tregurnow stone circle to Boscawen-ûn and then to Bartinney Castle. 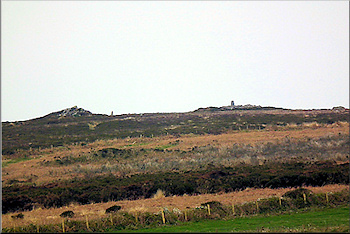 Both Bartinney and Chapel Carn Brea were beacon and ceremonial sites, visible from the Scillies. Boscawen-ûn might plausibly host a number of rock carvings on its central stone, representing two axe-heads or feet, and another higher up. This is important since carvings on menhirs and stone circles are rare. The possible alignment of the elliptical shape of the circle to the lunar maxima and of the near-central stone to the summer solstice rising point indicates an intentional marrying of the solar and lunar calendars, and a positioning and shaping of the circle to integrate these into the structure of its design. This complex is different again, though it has some parallels to the Merry Maidens complex, inasmuch as its long axis runs roughly WSW-ENE. 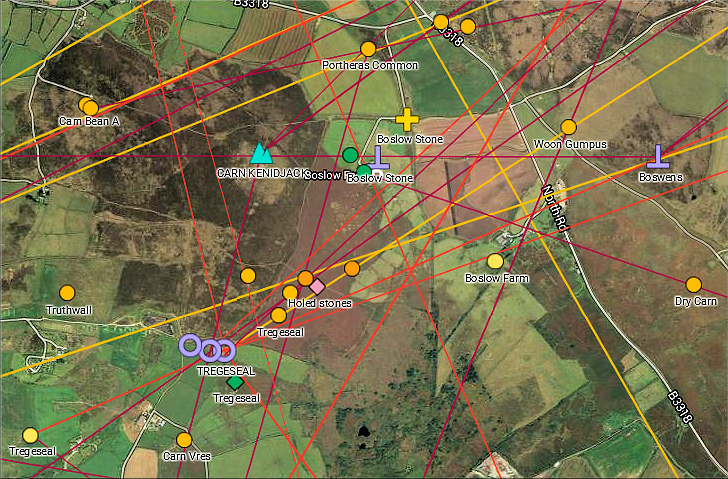 It is also linked by backbone alignment to Carn Brea near Camborne (not to be confused with Chapel Carn Brea) and it had either two or three stone circles and at least four holed stones in former times. But it is different since Tregeseal is dominated and cradled by Carn Kenidjack, and its main peripheral features are cairns and tumuli rather than menhirs. 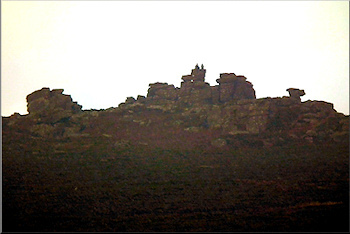 Just to the SSE of the surviving circle is an interesting rock outcrop with a spring, not usually recognised as an active part of the site, but quite energetic, acting as a viewpoint overlooking the circles and slightly counterweighting them in relation to Carn Kenidjack, the Hooting or Howling Tor. The holed stones were presumably oriented (they had fallen down and were re-erected by a farmer), possibly pointing at or towards the more distant Boswens menhir, or toward certain points on the Isles of Scilly. The holes were mostly quite small (3in or 8cm). It's difficult to know what they were there for. Inside the circle six intersecting underground streams meet (at different levels) and it has been found that natural radiation inside the circle is significantly lower than outside it. A number of chambered cairns lie to the ENE of the circle and close to the holed stones, mostly in a poor state. One of them is kerbed and the other has a distinct stone chamber. A processional route probably went from the stone circle to the airns and the holed stones, then turning up the hill to Carn Kenidjack. Another chambered cairn is southwest of the stone circle. 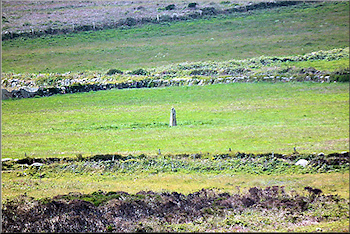 Menhirs are not part of this complex, except for Boswens menhir, visible up on the hill to the ENE, which is connected by alignment to the southwestern chambered cairn, the surviving circle and West Lanyon Quoit. The main feature of the complex is Carn Kenidjack, the Hooting Tor, so named because of sound phenomena reputed to arise during storms. It is a hauntingly mysterious tor, used as a sacred hill in neolithic times. 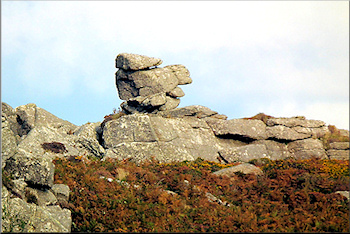 Two natural simulacra (rocks looking like beings) are on the carn (see right and below). Carn Kenidjack hovers over Tregeseal stone circle, holding the circle in its lap. An interesting alignment runs from Carn Kenidjack, through the now-destroyed central circle to a cairn close to Carn Lês Boel many miles away. This area of Truthwall Common is rich with legends of the Otherworld: fairy folk, demons and devils. One story tells of how a local miner chanced upon a Fairy Feast at the circle and was bound in gossamer thread and left there all night; another tells of an encounter with the Devil himself on Carn Kenidjack, which dominates the horizon from the circle; and yet another tells of Pee Tregear who was piskey-led here and encountered the little folk. All these stories may be memories of the ancestors and spirits of the dead, for this whole area was formerly covered with prehistoric barrows, burial mounds and megalithic monuments. The Nine Maidens is on a rounded north-south ridge passing south from Carn Galva, and overshadowed by it. From the circle Carn Galva looks like a rounded pyramid. Carn Galva was originally, in the neolithic era, a tor rising up out of the trees and a central place in the peninsula because of its prominence but, during the bronze age, considerable woodland clearance denuded the ridge on which the Nine Maidens stand, clearing the space for the stone circle and its complex. The ridge would have been sweeter and less bleak and peaty in the bronze age, a warmer and more equable time than now, and then also unaffected by tin-mining at the nearby Ding Dong mine. There are probably far more cairns and barrows around the stone circle than now are visible in the tufty heather. Close-in, the complex follows the ridge from a few cairns to the south to a standing stone in the north-west and then, further still, at Boskednan Cairn, there is a group of barrows which, although robbed, nevertheless have quite a strong feeling. Following the track down toward Mên an Tol, there is the felled Four Parishes stone, a boundary marker rather like a menhir. Further down the hill are Mên Scryfa, a rare inscribed stone taken to be from the Romano-British period but very much like a menhir that was later carved on, and then Mên an Tol, formerly a second stone circle but now much reduced. Its current format was set in Victorian times. The two stone circles were clearly a pair and complementary. Overlooking the whole area is Carn Galva, chief mountain of Penwith, even though the neighbouring hill, Watch Croft, is actually the highest. It's not just a visual impression but an example of the way that earth energy and the bold shape of Carn Galva can modify our perception to make this lower hill look higher or more impressive than Watch Croft. 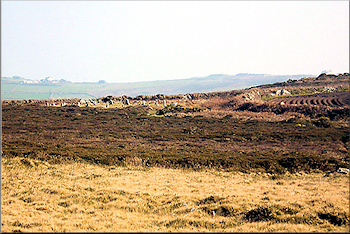 Carn Galva is a neolithic tor hill - in the neolithic one of Penwith's most important sites. Watch Croft has one or two barrows on its summit and, rather mysteriously, a little way down the hill is a menhir in a seemingly inconspicuous place. It's natural to wonder why precisely it is there. However, there is a good reason: as seen from just below the Nine Maidens, close to Mên Scryfa, it stands out on the horizon. Why this should be, we do not know, but it is clearly intentional. It is regrettable that more of the stone circles are not alive and present in the Penwth landscape today. We know little about the disappeared circles. Even today there are ongoing battles to keep the existing circles in good health, with threats particularly from mobile phone masts, cattle grazing and offical English Nature land management policies and detectorists. 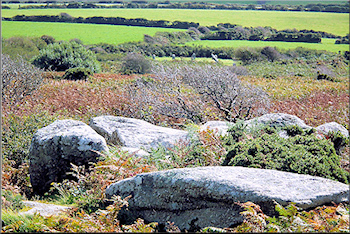 Sad to say, even the authorities cannot fully be relied on to understand or protect Penwith's ancient sites, easily tempted as they are by short-termist, narrow and vested interests. After all, phone masts are more profitable. These are not just historic monuments. They are sacred technological devices with a value and significance that is gradually becoming more visible to us as our ideas change and we confront the enormous question of sustainability, balancing the world's climate and ecosystem and correcting humanity's relationship with them. 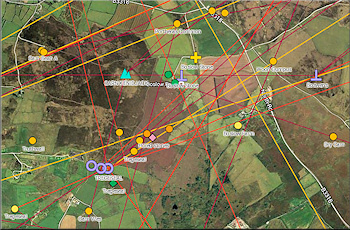 The stone circles and other megalithic sites give clues as to how this might be done.